New research from the Center for BrainHealth at The University of Texas at Dallas reveals that the amygdala may play a larger role in the brain's ability to recognize faces than previously thought. "The amygdala is a part of the brain associated with survival—fight or flight. It acts as a gateway regulating what we pay attention to," said Dr. Daniel C. Krawczyk, deputy director of the Center for BrainHealth and associate professor in the School of Behavioral and Brain Sciences. "We would expect the amygdala to be activated in the presence of scary or threatening faces—something that our brain might perceive as potentially impeding our survival. 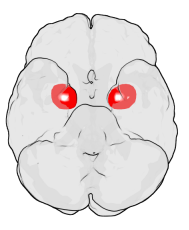 However, we were surprised to find how active the amygdala is in the presence of emotionally neutral faces." "This finding highlights the importance of social cognition, which includes the ability to recognize faces. This process is key for our survival," said Krawczyk, the study's co-author and the Debbie and Jim Francis Chair in Behavioral Brain Sciences. "While this study helps to further elucidate the role of the amygdala in visual recognition and memory, it is not exclusive to TBI patients, and indicates that further research with other patient populations is warranted," said Dr. Leanne R. Young, executive director of the Brain Performance Institute at the Center for BrainHealth, who led the study. Evidence of face-selective activity in the amygdala was found in 60 percent of participants, demonstrating that the amygdala strongly responds to neutral faces. The amygdala was less responsive to scene stimuli than the FFA. This face-specificity is of particular interest for neuroimaging tasks used to evaluate the impact of frontal lobe impairments on strategic attention. "Numerous studies have revealed that the amygdala is critical for consciously and non-consciously processing facial expressions, and a smaller set of studies has revealed a role for the amygdala in assessing whether an individual appears to be trustworthy or not. Our study, however, is the first to indicate that the amygdala actually responds more selectively to faces than the fusiform face area," Young said. "These findings lead us to believe that the amygdala may be getting a 'preview' before the brain's primary visual cortex sends the signal to the fusiform face area."